Just in time for the school holidays, The Astounding Antics Of Anthony Ant will have you tapping your toes, singing along and clapping regardless of age or ethnicity. Join Ant-hony (Berry), a character from Goggas, in his own little adventure, as he attempts to save his colony from a mysterious poison. He seeks the help of his aunt Sybil-ant (Chantal Stanfield), a sorceress with magical spells. She knows what to do, but doesn’t always get it right first time. She has the audience repeating ridiculous spells, helping the characters along the way. On Anthony’s mission, he meets a number of interesting characters, including the evil Arrog-ant (McGrath) and his beautiful daughter Mary-ant (Helberg). You’d be surprised how many words include the word “ant”, or at least can be modified to do so, and the joke never grows old. Anthony, and Mary-ant take a liking to each other, but in the ant world, green ants and yellow ants don’t mix. Think Romeo and Juliet except everyone lives happily ever after. This tale, by renowned children’s author Pieter Scholtz, is a truly South African production, mixing an array of cultures and music, including popular songs like Mi Casa’s Jika and Bonnie Tyler’s I Need A Hero. The actors are all great, though Berry stands out. You could easily watch his self-assured character faffing around all night, winning over the audience with a simple wink of the eye. 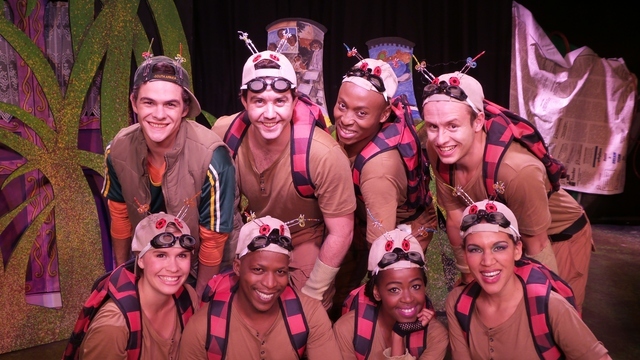 With paperclips as feelers and reflective vests distinguishing green from yellow ants, you cannot help but laugh at the bravado of these actors. Directed and staged by Francois Theron with costumes by Sarah Roberts, The Astounding Antics Of Anthony Ant is an interactive theatrical treat. After every performance the audience can meet Ant-hony and his friends.